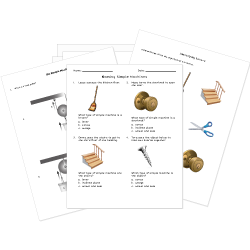 Our simple machines worksheets help support your teaching of the pulley, lever, screw, wedge, wheel and axle, and inclined plane. Don't see a printable you need? Use our Test Maker™ to create your own printable that fits your needs. Browse simple machines questions or use our advanced search to find existing questions while filtering by grade levels and keywords. You can also create your own questions.